There are many roles in the Film making process that require a person to be a sound technician and an equally accomplished artist. The Editor of a Film is a critical role that also draws in equal measure on creative talent and technique. At the most basic level, the role of a Film Editor is to put together the scenes of a Film in a manner where they are entertaining, engaging and tell the story as it was intended to be told. Let us exemplify this point. If it is a romantic comedy, then it is the Editor’s job to place visual and time emphasis on crucial moments in the Film. Likewise, in a thrilling crime drama, it is an Editor’s skill to build and sustain the suspense of the Film. This can be done by pacing the edit in a certain manner, cutting shots and scenes intelligently to reveal just enough to tease the audience. Therefore, not only must the Editor possess an extremely keen sense of story-telling, he must also be armed with the technical tools to accomplish these goals. Hence, the artistry and technical wizardry combination. Editing, in more than one way, is direction in post. An Editor is the first critic of the film. But unlike the passive viewer, or the regular critic, s/he takes an active part in presenting the story in its most effective, streamlined packaging.It is an extremely rewarding but arduous job that needs careful studying. And perhaps the best way to receive this comprehensive training is by attending a great school. 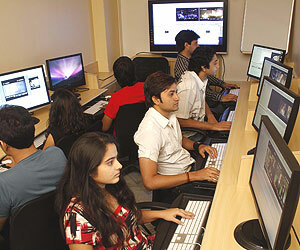 Digital Academy – The Film School, has finally arrived in India to impart a world class education in Film making. The Editing program at DA will instruct you not just about the theory of editing, but also in all the aspects relating to story-telling and the nuances of a keen story sense, and then back that up with hands on training on industry standard equipment. A program at DA will be like editing out the years of struggle and self-teaching that will be replaced by a robust and complete education, and the confidence to take on the world of Films.